Posted on May 30, 2016 at 5:57 am. Your HVAC system is probably the most used, and hardest working appliance in your residence or business. It is the silent partner that keeps you, your family, pets and employees comfortable. It is fair to say that the purpose of an HVAC system is creating an ambient temperature, and therefore a comfortable environment where people can relax, yet also be productive. Its primary function is to move heat around and cool air to the degree people require. It sounds simple, but achieving this is quite complicated and dependent on a detailed system of components. A furnace pushes heat through a space, while the air conditioner removes the heat. The air is distributed throughout different rooms normally by a system of ducts and the thermostat regulates the temperature. Fans, filters, return air inlets, supply air outlets and heat exchangers play a large part in all of this as well. With so much activity going on within a system it is important to take care of all the individual sections so that your HVAC system can continue to function well. At least once a year, have a technician come out and perform a routine inspection and maintenance check. Be sure to do your part and change out the air filters and make sure no items are blocking vents and debris is kept away from any outside or rooftop components. The average lifespan of a HVAC system is about fifteen to twenty years. Proper maintenance can help increase this. 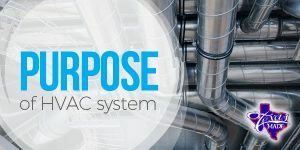 If your HVAC system is starting to cause higher power bills, doesn’t seem energy efficient, is acting inconsistently or starting to perform in a subpar manner, then it is no longer living up to its purpose. At this point, it may be time to consider a system overhaul, an upgrade or a new installation.